We are very much looking forward to welcoming all of our families to Exhibition Day tomorrow to celebrate the wonderful work your children have been engaged in throughout the year so far. Please do join us at 9.30 a.m. at Lower School for a glass of Bucks Fizz and the opportunity to visit our stunning new Lower School classrooms. Ducklings and Upper School will be open from 10.00 a.m. for your children to show you around and refreshments will be available in the Evans Hall from 10.00 a.m.
On Monday 25th March we will be hosting the Junior and Senior School Speech Competition finals. Parents of Junior Speech Competition finalists (Years 1 - 3) are invited for refreshments in the Evans Hall from 8.15 a.m., before taking their seats in the Upper School Hall for the competition, which will begin at 9.00 a.m. The Senior Speech Competition finals (Years 4 - 6) will begin at 2.00 p.m. Parents may enter the school to take their seats from 1.50 p.m.
For both competitions, children will perform their pieces one year group at a time. The children will receive feedback from our guest judge, Reverend Ken Kingston. Each finalist will receive a finalist certificate; there will also be some 'highly commended' awards and a year group winner for each year group. When all year groups have finished, an overall winner will be announced, receiving the Speech Competition trophy. The criteria for judgement are expression, projection and clarity of the voice only. No gestures will be counted towards the judgement and choreographed actions are not to be used. Good luck to all the children who will be taking part in the finals; we wish you well with your practice and preparation! At Lower School, the Nursery and Reception Poetry Recitation will take place on Tuesday 26th March and all Nursery and Reception parents are warmly invited to attend. Coffee will be served from 8.15 a.m. in the Methodist Church Hall for Nursery and Reception parents. Nursery parents should take their seats in the Lower School Hall ready for the recitation to begin at 8.45 a.m. Reception parents will be called through from the Methodist Church Hall to take their seats when the Nursery have finished (expected to be at around 9.20 a.m.). We do hope many of you will be able to join us for what is always a very special morning! 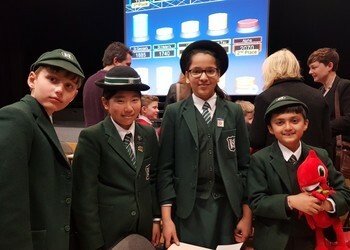 Our Quiz Team took part in the Prep School General Knowledge Quiz semi-final this week at Merchant Taylor's Prep School. The children performed extremely well against 11 other prep schools who had also reached the semi-finals. After some very tough rounds, we were delighted to learn that our children came in 5th place overall. If you have a budding artist in the family, why not encourage them to design a Starborg card for the London Borough of Hillingdon's Summer Reading Challenge competition. Starborg cards are like Top Trumps cards; your child should use their imagination to design their Starborg, which must be colourful, based on an animal and have some special super powers (preferably space-related to tie in with this year's theme). You can check out the current Starborgs for ideas at www.hillingdon.gov.uk/starborgs. Designs may be hand-drawn or digital but must be submitted electronically by email to summerreadingchallenge@hillingdon.gov.uk by Wednesday 1st May. The best Starborgs will be chosen to be part of the new pack of 20 cards, which are given away in their thousands to children across the borough as part of the summer reading challenge. Good luck to all entrants. Our chess teams defeated local rivals St. Bernadette's in their match on Thursday this week. Matches against St. Bernadette's are always closely contested and of a high quality so very well done to our teams for securing the win! In round 1, we won 4 boards and so did St Bernadette's, so after the break we resumed play level. However, in round 2 we managed to win 6 boards to 2, so the match finished a 10-6 win for St. Helen's College. This has been an exciting culmination of school chess this term and we are looking forward to an equally exciting next term. Uxbridge Chess Club Open New Branch At St. Helen's College! The very popular and successful Uxbridge Chess Club are today launching a new Friday session at St. Helen's College. If you have a son or daughter who is interested in playing chess, or who already plays chess at school and would like to pursue this interest further, do encourage them to join. The club is launching on Friday 22nd March and sessions will run from 6.00 - 7.30 p.m. on Fridays in The Evans Hall. Participants will have the chance to take part in all sorts of competitions and the club is open to all children aged from 6-15, not just St. Helen's College children, so there is the opportunity to bring along friends and family from other schools too. Uxbridge Chess Club is run by two St. Helen's College parents who, like Mr. Foale and Mr. Crehan himself, are passionate about chess and about inspiring a new generation of chess players. As a game, chess helps to nurture memory skills, strategic thinking, gameplay, time management and more so it is not only extremely enjoyable for children, but extremely educational too! We do hope that many of you will encourage your children to attend this club. Full details, costs and arrangements are available here. Term ends next Friday, 29th March, and arrangements are as follows. Ducklings and Nursery children should be collected at 11.50 a.m., Reception children at 12.00 p.m. and Year 1 children at 12.10 p.m.
Upper School children will attend our end of term Easter Service at All Saints Church at 11.00 a.m. and all parents are warmly invited to join us for this. Pupils will then return to school for collection at 12.10 (Year 2), 12.20 (Years 3/4) and 12.30 (Years 5/6). We ask parents NOT to park along Parkway so that traffic may flow freely during the busy end of term pick up. Sign up for summer term co-curricular activities opens today and closes next Wednesday (27th March). Please log in to your SchoolsBuddy account to indicate your child's preferences and please remember only to indicate a preference for a club if your child would definitely like to take part. Allocations will be confirmed at the start of next term.